A clean, modern, fast loading WordPress theme for creating professional looking sites within minutes. 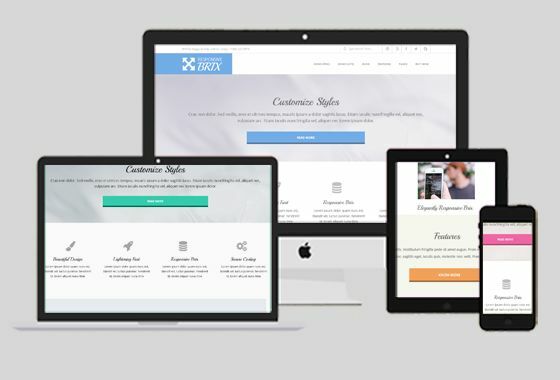 Responsive Brix is a minimalist, fast loading ('A' Grade Google Page Speed), retina-ready, responsive theme with a modern clean design and easily customizable options. The theme is rigorously tested and optimized for speed and fast page load times and has secure and clean code. 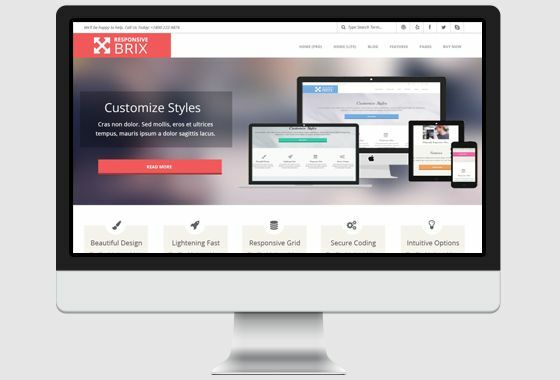 Create professional looking websites with Brix within minutes! Responsive Brix comes with the popular Font Awesome library with 991 icons that can be used throughout the theme in widgets and Options Panel. Responsive Brix is translation ready which means you can easily use a plugin like Polylang to translate all theme strings into your local language. Responsive Brix follows the best coding practices to make sure your site is robust, secure and compatible with most WordPress plugins out there. Responsive Brix performs beautifully, thanks to its powerful, consistent, lean and bloat-free code. Responsive Brix Premium lets you select different colors for different sections of your site. Assign different typography (fonts, text size, font color) to menu, topbar, content headings, sidebar, footer etc. With the integrated Google Fonts library, you can find the fonts that match your site's personality, and there's over 600 options to choose from. Designed for Responsive Brix Premium, these shortcodes are very well integrated into the code to reduce loading times, thereby maximizing performance! Responsive Brix Premium allows you to create unlimited sliders with as many slides as you need. You can use these sliders on your Homepage widgetized template, or add them anywhere using shortcodes – like in your Posts, Sidebars or Footer. Responsive Brix Premium gives you the option to display your post archives in 3 different layouts including a mosaic type layout similar to pinterest. Custom widgets crafted and designed specifically for Responsive Brix Premium Theme give you the flexibility of adding stylized content. Responsive Brix Premium comes bundled with many additional premium background patterns. You can also upload your own background image/pattern to match your site design. Automatically open image links on your site with the integrates lightbox in Responsive Brix Premium. CSS is passe! Developers love the modularity and ease of using LESS, which is why Responsive Brix Premium comes with properly organized LESS files for the main stylesheet. Need help setting up Responsive Brix? Upgrading to Responsive Brix Premium gives you prioritized ticket based support. We have a growing support team ready to help you with your questions.